Concrete surfaces are prone to damage, both physically and structurally. It is a very porous material so any stain or discolored spot can be quite difficult to remove. Some homeowners are seeking help replacing the current finish that they have especially when it starts to flake, crack, bubble, or peel. Whatever the case, there are concrete refinishing coatings that can turn all those around. Is Refinishing the Same as Resurfacing? It is common for people to confuse or interchange refinishing with resurfacing. There is just a slight difference between the two. Refinishing is changing or updating the finish or uppermost layer of a concrete surface. Common issues are stains, discoloration, and worn out finishes. Resurfacing, on the other hand, involves more than just applying a finish. To resurface concrete also uses a thin layer of overlay or coating to replace the old surface of the concrete slab. Stained Concrete – When concrete starts to look dull, old, and worn out, a splash of color would create a refreshing transformation. This indoor concrete floor finish which comes in both acid and water-based stains, offer a wide range of color selections. Trying to match the color of your exterior or an old connecting surface? In concrete staining, colors can be customized to create a match ideal for any patio, pool deck, driveway or garage flooring ideas. 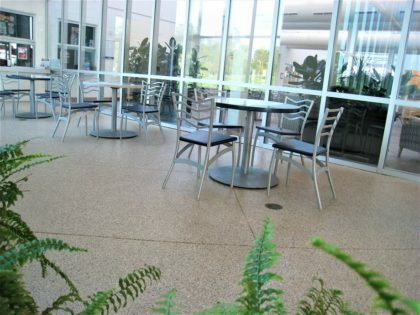 Polished Concrete – Several scratches on concrete can make it look dull and flat. Spotty white spots may also soon appear due to certain minerals rising up to the surface of the slab. To get rid of this and acquire a more elegant shine, polishing the concrete is highly recommended. This grinding process removes the uppermost layer of the concrete and sands the new surface until it is smooth and shiny enough to reflect light. Concrete Sealing – Most contractors recommend sealing any concrete surface. This makes sense because concrete is such a porous material so it needs a protective layer that will keep any coating or finish intact. Sealers, however, only last a couple of years so it is a must to have it resealed to maintain the sheen and protection it provides. Additional services, such as custom scoring, engraving, and more. Tired of Dealing with Dull and Unfinished Concrete? Call (720) 545-1766 to Breathe New Life into Your Concrete Spaces. Stains, patches, and discoloration may just be superficial but it hugely affects the value of any concrete surface. Even physical damage deserves to be addressed appropriately. Denver Concrete Artisans, a concrete refinishing company, offers efficient concrete refinishing systems to improve and update patios, driveways, pool decks, interior floors, and other concrete surfaces. We guarantee concrete surfaces that look like something out of a magazine. Call or email us to request a free in-home consultation, inspection, and estimate.